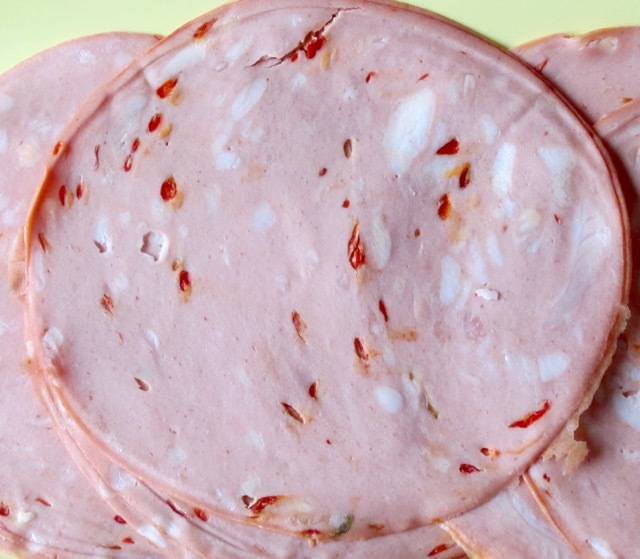 Mortadella is a large round smooth textured Italian sausage made of finely ground pork or pork and beef, mixed with pieces of pork fat and seasoned with salt, garlic, pepper and several other spices (that may include cinnamon, cardamom, pistachio etc). It’s sometimes studded with pistachio and green olives. The diameter may be up to 45cm (18 inches). 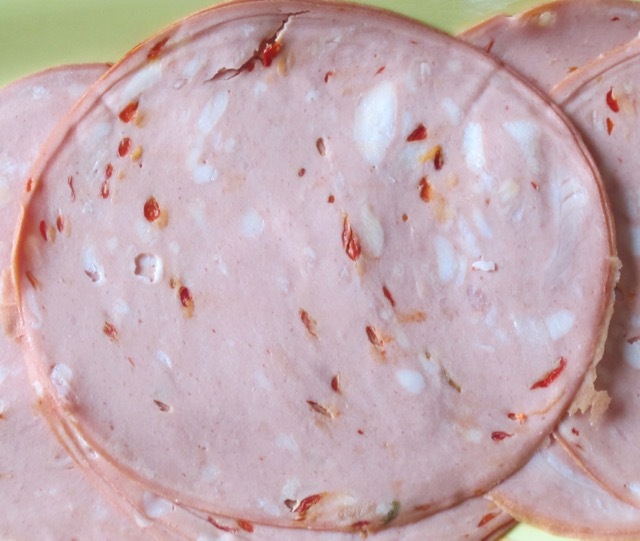 Authentic mortadella is originally from Bologna, Italy and is made from pure pork. Cheaper varieties may contain beef, pig’s head, soya flour, tripe and artificial food colouring. Please check the ingredients list of the product you buy. The sausage is encased and cooked, unlike the raw-cured and air dried salami. It’s more moist, rather bland in taste and of less superior quality compared to salami. 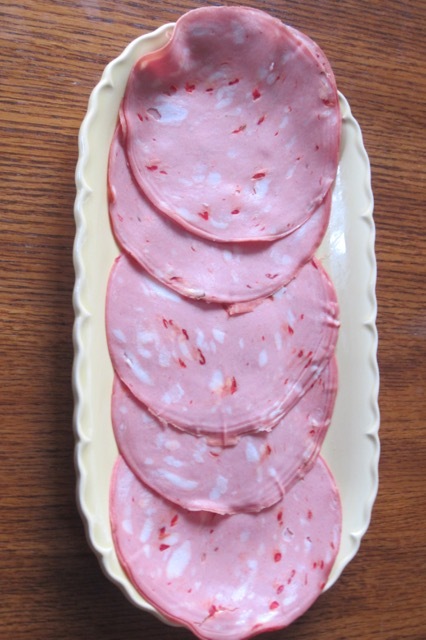 Mortadella is usually thinly sliced and served cold. It’s a perfect companion to sandwiches, anti-pasto boards (assorted cold meats) and pizzas. It can be sliced and stirred into risotto or pasta sauces at the end of cooking. It can also be finely chopped to make stuffing for poultry. My dear Liz! This is great! A post on mortadella! Of course,in Italy, we don’t even think about it anymore, mortadella is always in our fridge! I prefer it with pistachio, anyways … you are fantastic! Please give me some Mortadella recipes! I hope to visit Italy, one day and eat all the food I hear of (cooked the authentic Italian way). Best wishes! I’ll think then i’ll write you! Yes I can béchamel sauce and grated Parmesan and black pepper, knob of butter. I shall be trying this one. Do I bake it? at what temperature? Cut the potatoes into thin slices and place them in a bowl with water. Drain well dab them with absorbent paper. Arrange on a baking tray covered with baking paper. Sprinkle with extra virgin olive oil and season with salt, freshly ground black pepper and rosemary. Bake in a hot oven at 200 ° for about 10 minutes or until lightly browned. Meanwhile, cut the mozzarella into small pieces. Remove the potatoes from the oven and place in a tower alternating them with the slices of mortadella and the mozzarella. Bake again for a few minutes to melt the mozzarella and serve immediately. This sounds really good. I’m going to try it. Is it in your blog? No Liz! I never thought to writing recipes with mortadella 😲..
You crack me up. Enjoy, Easter Weekend! Mortadella mousse: you can use it with cream puffs or spread the zucchini and roll it up or on bread with tomatoes and anchovies for croutons or use it as you want! To prepare the mortadella mousse, first of all collect the diced mortadella, the ricotta and the grated Parmesan in the jar. Operate the appliance until a homogeneous and not lumpy mixture is obtained. Add the cream and continue to blend to obtain a mousse. Yes you have. Thanks for your time and attention!